John Leveridge was a prominent attorney in 1848. His law offices were conveniently located in his row house at 145 Cherry Street, one block from the East River. What was not convenient, however, was the lack of banking in the neighborhood. To resolve the problem, Leveridge founded the East River Savings Institution, named after the nearby waterway. On opening day Irish immigrant Mary Linny strode into Leveridge’s office, which now doubled as the bank, with perhaps a little trepidation. Mary, who worked as a domestic servant, did what until a month ago was unthinkable. She opened a bank account. Until the passage of the Married Women’s Property Act bank accounts in a woman’s name were illegal. The bank was the first savings bank to offer women the right to control their own funds deposited by them. Mary Linny became not only one of the first clients of the East River Savings Institution, she broke ground as one of the first women in New York State to open a bank account. The bank remained in Leveridge’s row house until 1851 when it moved to Chatham Square. Only two years later its growth demanded new space at 3 Chambers Street with deposits now topping $1 million. While other banks failed in the great Financial Panic of 1873, the East River Savings Institution survived and by 1895 deposits totaled more than $10 million. In 1923, after the bank had moved two more times, a law permitting branch banks for savings institutions was passed. The bank moved swiftly. Two years later it purchased two tenement houses at the northeast corner of Amsterdam Avenue and West 96th Street. The same year the bank’s name was officially changed to the East River Savings Bank. The architectural firm of Walker & Gillette was commissioned to design the new building and plans were filed that Fall. The company was best known for residential designs – mansions and apartment buildings—however following the world war it received a series of bank commissions. The tenement buildings were demolished in May, 1925 and construction began. By the time of its completion on February 8, 1927 the new building would cost $265,000. Walker & Gillette managed to do just that. While Art Deco was shaping the look of Midtown buildings; the new branch would echo the classic temple design to which customers had become accustomed. An Ionic portico of two immense columns faced the avenue while an imposing colonnade stretched along West 96th Street. Rather than imitate the more expected Roman protocol in which the columns would sit on stately pedestals; the architects sat them squarely on the sidewalk in the Greek fashion. Double-height windows separated the engaged columns of 96th Street, hinting at the soaring space inside. Above a hefty entablature hid the penthouse floor of the bank offices. It was a limestone and marble temple to savings and thrift. The branch opened with little fanfare on March 5, 1927. 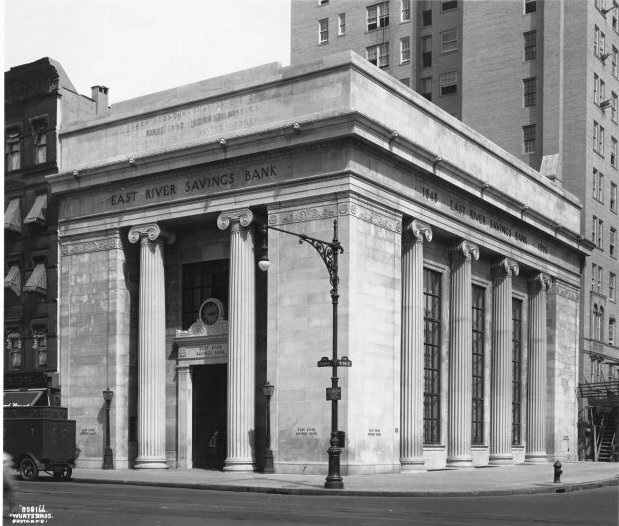 Despite the onslaught of the Great Depression two years later that crushed banks nationwide, the East River Savings Bank not only survived, but grew. On April 12, 1931 The New York Times announced that “to provide additional facilities…the site occupied by two old five-story flats on the avenue adjoining the present bank building on the corner will be utilized for an addition to the building.” The bank at the time had over $118 million in resources. Things continued to go well for the bank, at lease for several decades. In 1932 it absorbed the Maiden Lane Savings Bank and the Italian Savings Bank of the City of New York—both banks founded to serve the immigrant community. Detectives traced the bill to the depositor, got a description, and the groundwork was laid for the kidnappers’ capture three years later. The 1930s was a time before Plexiglas teller windows and armed security guards. Tellers often carried their own firearms not just to protect the bank, but for their own safety. John E. Nilsen was one of them. On July 24, 1936 as the 30-year old teller was preparing to close down his cage, he emptied the bullets from his pistol. Around 4:15 pm, not realizing he had removed only five bullets from the .38-calibre weapon, he accidentally discharged it. The sixth bullet struck him in the right eye. The ten-year veteran of the bank tragically died two hours later. Two decades later the country was overcome with fears of nuclear bomb attacks, as global tensions increased. New Yorkers in 1951 were instructed regarding home bomb shelters—what essentials they should contain, and how to create them from coal cellars, interior halls, etc. Two four-foot scale models of recommended home shelters were constructed by the Port of New York Authority and displayed in the lobby of the East River Savings Bank. The success of the bank had lasted over a century and a half. But by the 1970s things started going downhill. Home loans and multifamily loans dropped off as interest rates skyrocketed. When the bank acquired two savings and loans institutions, thereby taking advantage of new banking laws permitting S&L’s to invest five percent of their assets into real estate, it became attractive to real estate moguls. One purchased the bank, changing it to the River Bank of America. Bad loans forced the Federal Deposit Insurance Corp. to issue a Cease and Desist order; and in 1995 the River Bank branches were sold to Marine Midland Bank. Within two years Marine Midland decided to divest itself of the branch. We just spent a couple of nights in a walkup across the street from this important building. Every morning we would look at it and wonder how in the world it became a CVS! Great, interesting, and informative posting--and pix! Thanks for posting! Fascinating!! I worked at this CVS in 2001-02 and completely unaware of its history connected to the Lindbergh kidnapping. It is a beautiful, unique building. Appreciate the details. My dad worked there when it was EAST RIVER SAVINGS BANK. As a porter he worked there from the 60s to the 90s in the midnight shift and morning shift on Saturdays. I use to fill in on the summer relief for a few years in the 80s. I new that bank inside out, from the top floor where the worker lounge and kitchen was to the big vault down stairs. I made my rounds with a black key punch clock every hour. it was a great bank with a lot of history. Great article! I saw this building when I was visiting New York. I just did a search since I was curious how such a stately building became a CVS. You answered my question perfectly. I worked at East River Savings Bank from 1971 to around 1980. I started at 30 Rockefeller Plaza then 60 Spring St. 26 Cortlland St. The World Trade Center when it first opened and 743 Amsterdam Avenue. If there are any of my former co-workers out there contact me, Joseph Corsi on Facebook. I'd like to hear from you! I used to come here when it was a bank with my mom as a kid. I thought it was the most amazing space in the world, the huge vault in the basement, the gigantic open main hall. Does anyone anywhere have a picture of the interior? Im so sad I cant find one.